1.The watch didn't work/ device offline, please contact us by email. Whether ask for item return or refund, we'll solve your problem less than 24 hour. 2.The watch worked, but for the GPS accurately has 1-4 miles error with the real position.For this problem, cause it's limited by GSM tech and GPS signal. 3.You need buy a SIM Card separately, We're recommend use Speedtalk you can search Speedtalk card on Amazon,and recommend open the $5 plan. 4. If the GPS Kids watch didn't work/ device offline,please check if you choose the correct area when you register the APP firstly.In US need choose "North America"
5.If have any issue, please contact us, we will help you!! 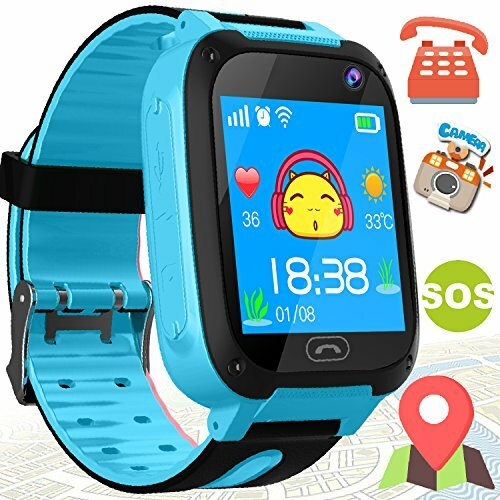 ◆2018 BRAND NEW DESIGNED CHILDREN'S SMART WATCH: This kids smartwatch built-in learning game, GPS + LBS positioning, phone call, SOS emergency call, voice chat, night flashlight, activity tracking, theme, photo album, camera, life waterproof, high sensitive touch screen, perfect match technology. Silicone wristband, gentler for children's skin. Rechargeable, multilingual support, intimate design, convenient and durable. Simple operation, to meet the needs of children. ◆SOS EMERGENCY CALL SMARTWATCH FOR KIDS: Insert a SIM card, saving telephone numbers in the "Se Tracker" App setting's telephone, to communicate with your child by sending calls, voice messages. Kids can one click SOS to get call if they in danger. Parents can control and settings via app. ◆SMART WATCH FOR BOYS GIRLS: The children can play through the touch screen and select the puzzle games, help to improve the intelligent of the child, increase sensitivity to numbers, exercise their ability to respond, logical thinking and hand-eye coordination, let the children enjoy the learning fun anytime, anywhere. Best choice for kids. ◆Kindly Note: We provide Smartwatch only but without SIM Card, please buy extra SIM Card, the smart watch suitable for intelligence development, visual, emotional, interest cultivation, parent-child communication ability training so on. Support iPhone and android phone. ◆OUR SERVICES: We provide warranty to the smart watch. If you are not satisfied with our products, or If you meet some problem in setting the watch. Before returning it back, please contact us and we will provide a full refund. Your satisfaction is our ultimate goal. We will make a reply in 24 hours to help you to solve the problem. If you have any questions about this product by Kidaily, contact us by completing and submitting the form below. If you are looking for a specif part number, please include it with your message.